As I think I’ve mentioned already, Manhattan in the summer becomes a pretty outdoorsy kind of place. Open-air cultural events abound, pavement cafes are packed out, and it becomes well-nigh impossible to get into any bar with a roof terrace. That said, this last week or so has seen temperatures soar into the 90s (90F is around 32C), which seems to be encouraging many to retreat indoors once again (provided there’s air conditioning, naturally). Last night was a case in point – my book group had long been planning to meet in Central Park for an evening of discussion, snacks and wine under the stars, but in the end it was deemed too hot so we ended up in a viciously air-conditioned bar instead. This was a great disappointment to several members of the group, though interestingly all the Americans seemed to have plumped for the indoor option – clearly it’s us immigrants from cooler climes who are keen to swelter outside. 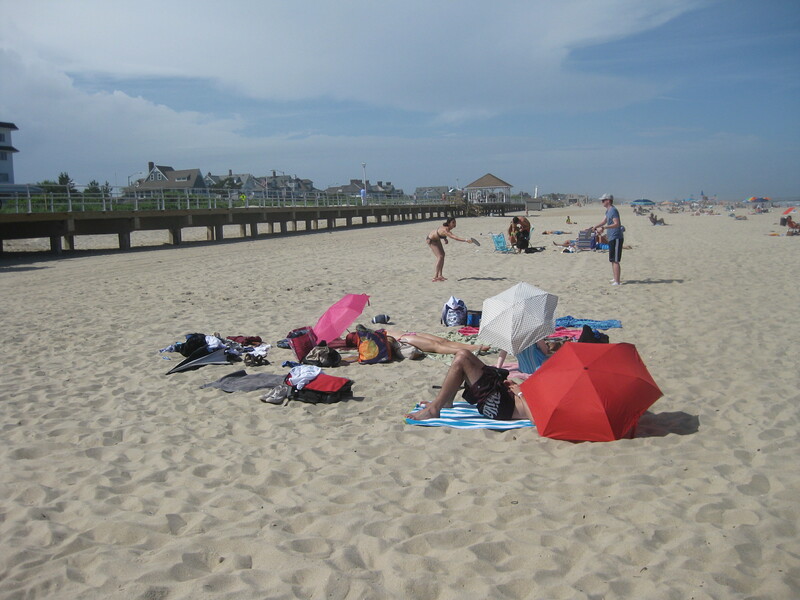 Last Saturday brought a similar reminder of such cultural differences, as one of our British friends had organised a birthday trip to the beach at Spring Lake in New Jersey. The forecast was for cloud, with a possible thunderstorm, and the day dawned grey and cloudy (though still more than warm). Although guests of a variety of nationalities had been invited, it was a group of 8 Brits who found themselves looking somewhat apprehensively at the looming skies outside the train windows. We had the last laugh though, as the clouds cleared around lunchtime and we enjoyed an afternoon of glorious sunshine, and the fresh sea breezes were a welcome change from the rather less invigorating city air. Tuesday evening found us sitting in Washington Square, eagerly awaiting that evening’s musical offering. 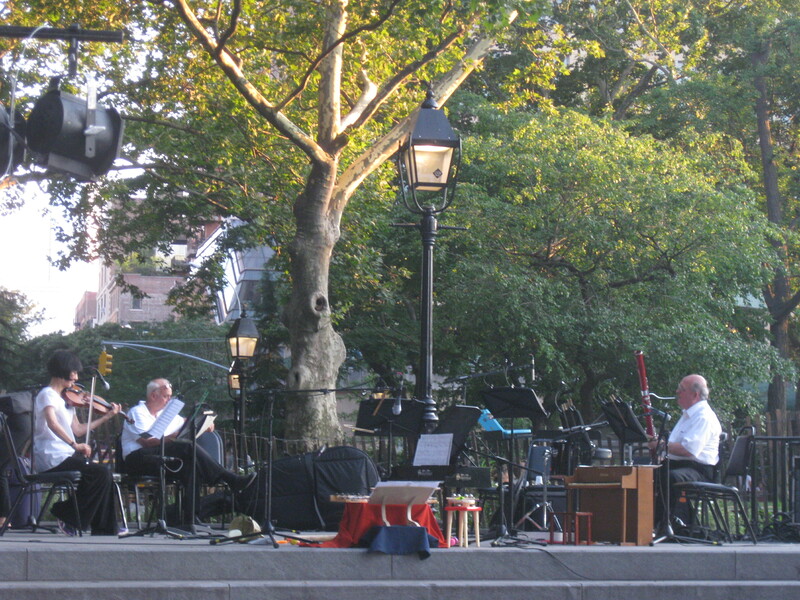 This was our second outing to the Washington Square Music Festival, but the previous week’s concert had been moved inside due to anticipated rain. 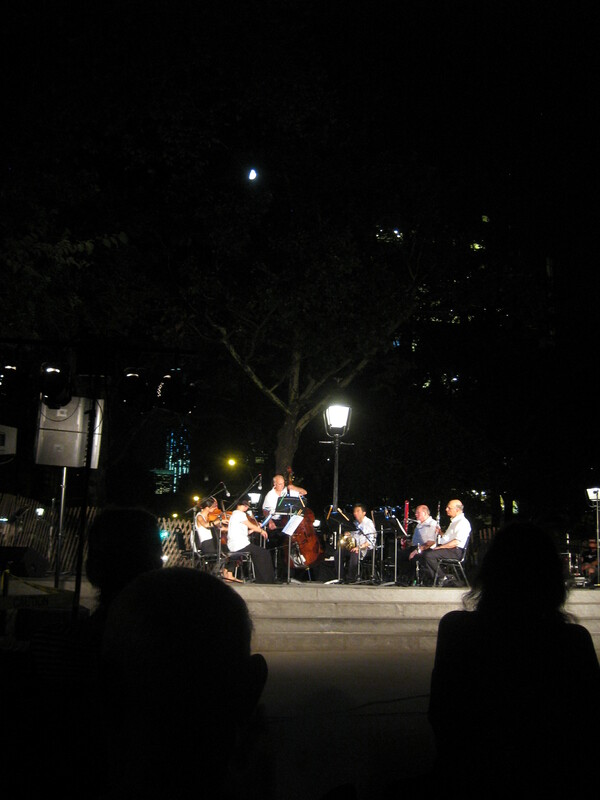 It was still a most enjoyable evening – a Telemann concerto and semi-staged performance of Eccles’ Judgement of Paris – although the lack of air conditioning made it a little uncomfortable (why is it that outdoor heat is easier to bear than similar temperatures indoors?). When I mention to people that we haven’t yet succumbed to the temptation of our very own AC unit I receive responses ranging from concerned to perplexed – mostly they’re too polite to actually say it, but it’s clear the natives think we’re obviously absolutely nuts. This entry was posted in Living and tagged beach, concerts, heatwave, Spring Lake, Washington Square, weather by Emma Davidson. Bookmark the permalink.